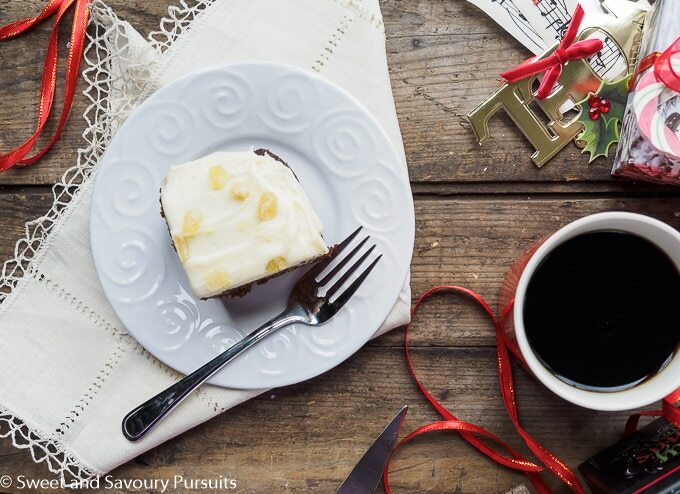 This Classic Gingerbread Cake with Cream Cheese Frosting is so flavourful, incredibly moist and so easy to make, you’ll likely find yourself making this more than once during the holiday season! I know what I’m about to say is bad (especially at this time of the year), but I have to say that I’m loving this non wintry weather we are currently enjoying in Canada’s national capital. Today is December 5th, there is no snow on the ground, the sun is shining and we are expecting a high of 8 degrees Celsius! Of course this cannot last long, so I’m thinking that I really must get out there and enjoy this beautiful day. But before I do that, I have tell you about this classic gingerbread cake with cream cheese frosting that I recently made. This cake is amazing, I love everything about it. It’s easy to make, incredibly moist, and the combination of ginger, cinnamon and cloves makes it so flavourful. 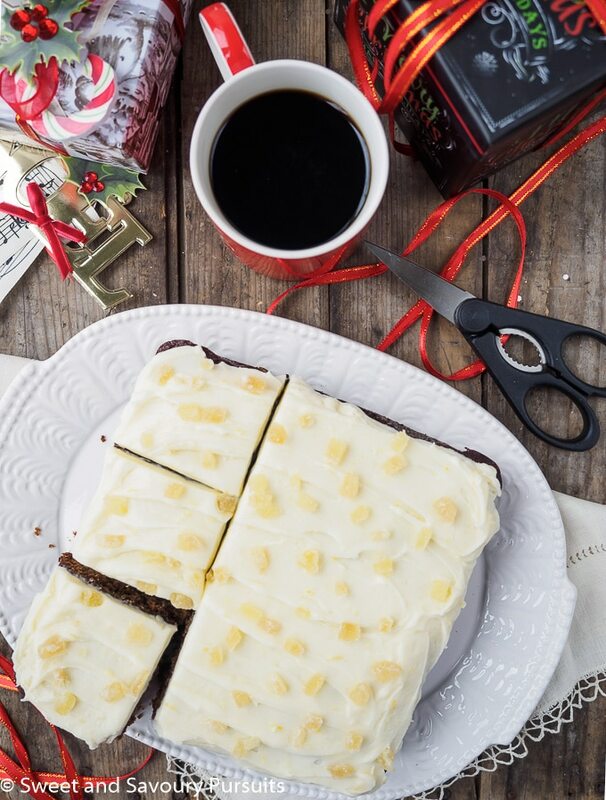 The gingerbread cake is delicious on its own but topping it with the lemony cream cheese icing and chopped crystallized ginger takes it to another level and makes this gingerbread cake extra special! I adapted the cake portion of this dessert from this Fine Cooking gingerbread recipe. Rather than using plain water as they do, I decided the spices in chai tea would be a perfect match for the spices in the cake, so I made a cup of tea and cooled it in the refrigerator before using it in the cake. I also wanted to dress this cake up a bit so I decided a lemony cream cheese frosting would be perfect here. I also sprinkled some chopped crystalized ginger onto the frosted cake, it’s entirely optional but I found it delicious. This classic gingerbread cake is the perfect treat for the holiday season. I know I’ll definitely be making it again before the season is over. Enjoy! This classic gingerbread cake with cream cheese frosting is so flavourful, incredibly moist and so easy to make, you'll likely find yourself making this more than once during the holiday season! Author: Sweet and Savoury Pursuits, cake portion adapted from Fine Cooking. Slightly butter an 8x8-inch cake pan and line it with parchment paper leaving an overhang on two opposite sides, this will make it easier to lift the cake out. Butter the paper slightly. In a glass measuring cup, combine 3/4 cup of boiling water with 1 chai tea bag, set to steep and cool in the refrigerator. Into a medium bowl, sift the flour, baking soda, ginger, cinnamon, cloves, and salt. Set aside. In the bowl of your mixer, beat the butter until smooth. Add the brown sugar and continue beating until light and fluffy. Scrape down the sides of the bowl and add the egg. Beat until well combined. Keep beating and slowly add in the molasses. Add in half of the sifted dry ingredients and mix just until well combined. Scrape down the sides of your bowl again and then add the remaining dry ingredients. Slowly add the cooled chai tea and stir until well combined. Pour the batter into the prepared pan and bake until a toothpick inserted in the middle comes out clean, 30 to 35 minutes. Let cool for 10 min before lifting the paper and cake out of pan. Let cool on rack (with paper). Once cake has cooled remove paper and place on serving dish. In the bowl of your mixer, on medium-high speed, beat the cream cheese and butter until smooth. Add the lemon juice, lemon zest, and vanilla extract, beat for 1 more minute. With the mixer on the lowest speed, add one cup of icing sugar at a time until you have the desired consistency, I used 2 1/2 cups of icing sugar. Frost the cooled cake and if desired top with the chopped crystallized ginger. That’s excellent, happy to hear that you enjoyed it. Thanks for letting me know! Thank you, it’s really quite delicious! Wow, this looks so good! I have to agree, as a fellow Canadian, I am LOVING the weather as well 🙂 But I am hoping to have snow on christmas day! Thanks! Yes, I agree snow on Christmas day is a must! So glad you’re enjoying the warmer weather 🙂 I’m loving the combination of flavors you’ve got going on here! These would make wonderful Christmas gifts. You know I hadn’t thought of gifting them but you’re absolutely right! Gingerbread and the holidays, they go together. This cake looks delicious! Another one to add to my list, love your baked goods. This coming week the biscotti are getting made, got all the dried fruits today. Yay, that’s wonderful Suzanne! I’m glad you like this recipe as well, it’s really delicious!